The neighborhoods of Chicago affected most by crime and violence tend to be some of the most economically depressed parts of the city, where jobs, commerce, and investment lag. Community leaders working on the ground to reverse this economic depression say their efforts have often lacked the coordinated planning, resources, and commitment from the city to sustain progress. But now, some of them see positive signs in a fledgling economic development program targeting South Side neighborhoods, as well as in other community finance tools emerging in Chicago. 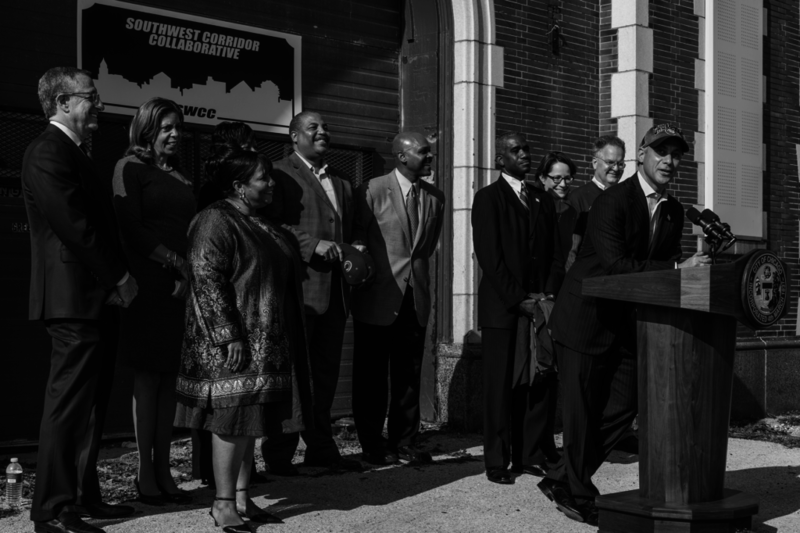 On Thursday, a trio of South Side community development organizations and the Local Initiatives Support Corporation (LISC) announced the launch of the Southwest Corridor Collaborative, a new revitalization effort targeting Englewood, Auburn Gresham, and Chicago Lawn. This effort comes on the heels of the Greater Chatham Initiative, which is focused on spurring economic revival in Chatham and nearby neighborhoods. LISC is working with the Greater Auburn-Gresham Development Corporation, the Chicago Lawn-based Southwest Organizing Project (SOP), and Teamwork Englewood to bring $50 million into the Southwest Side over the next decade via real estate investments and small business lending. But this time, the city has signed on as a planning partner, promising to work with community groups to outline the vision and investment framework needed to make the collaborative work. LISC executive director Megan Harte said she anticipates that leveraging city funds will be a significant part of the process. Jeff Bartow, executive director of SOP, said that many an economic development initiative has claimed to be a new engine for growth in South and West Side communities, but most have fallen short of expectations. “I think when they don’t work, usually it’s because there’s not…enough relational depth,” he said. “What I mean by that is a real, deliberate weave that crosses a lot of sectors, in terms of a shared understanding of what’s being done and a broad base of people being behind it.” Bartow said SOP hopes to attract new businesses to 63rd Street in Chicago Lawn, where successful businesses currently operate among a host of vacant storefronts. “This may be an opportunity to bring a coffee shop, bring a bakery, bring additional restaurants and other businesses,” he said. Perry Gunn, executive director of Teamwork Englewood, said his organization intends to focus on creating manufacturing jobs in Englewood. Teamwork Englewood seeks to replace some of Englewood’s vacant land with factories or manufacturing facilities of some kind, especially around the new Whole Foods. Gunn also mentioned another focus: preparing people with criminal records for the workforce. “That population needs to be prepared to go back to work; we can’t leave them out there hoping they find something,” he said. “They won’t without the right kind of support.” He added that investment in Englewood still has to address public safety issues—real and imagined—that might deter business growth. Carlos Nelson, executive director of the Greater Auburn-Gresham Development Corporation, said his organization’s community planning process indicates the need for access to good health services and jobs. He revealed plans to buy and redevelop a 55,000-square-foot building that would be reborn as “the Auburn Gresham Healthy Lifestyle Building” and provide 150 to 200 living wage jobs, according to Nelson. Nelson said the acquisition and redevelopment for the Healthy Lifestyle Building, whose address he said he wouldn’t disclose before the purchase of the building is completed, will cost about $8-$9 million. Construction would begin in mid-2017 and end in late 2018. Nelson said three prominent health care providers, including “a big hospital in the city,” are vying for an anchoring role in the project. The building could also contain a sit-down restaurant, a customer service call center for a yet-to-be-named company, and more, Nelson said. In May, a New York Times poll found Emanuel had a sixty-two percent disapproval rating among Chicagoans—and a seventy percent disapproval rating among the city’s black residents. The mayor attributed the numbers to Chicago’s legacy of neglecting South and West Side neighborhoods. “Look. Over forty years, there has been a de-investment in the South Side and the West Side of the city,” Emanuel responded at the time, pledging to do his best to reverse the trend. To be fair, the city’s disenchantment with its mayor is about more than financial neglect. His administration did close dozens of schools in 2013 and more recently exacerbated tensions between police and minority communities with its handling of the Laquan McDonald shooting. But Emanuel has gotten some praise recently for what looks like an increased focus on economic development in communities of color on the South and West Sides. So far, the mayor’s office has committed to a $4.7 million streetscape and a $12 million library renovation in Chatham as part of the Greater Chatham Initiative, which was spurred by U.S. Representative Bobby Rush after a stray bullet on 79th Street killed a Chatham teacher and real estate agent. Nelson also sits on the board of that revitalization effort. The executive director of the initiative, Nedra Fears, said that she is developing several programs with partners that will be announced by the end of the year, including the Greater Chatham Workforce Center and other projects hoping to grow and attract businesses and plans to give makeovers to major commercial strips. But unlike the Greater Chatham Initiative, the Southwest Corridor Collaborative has thus far been willing to disclose how much money is fueling its efforts and a timeline for investing those dollars. In recent decades, economic decline in many black neighborhoods and the closure of many of the city’s manufacturing facilities has coincided with the concentration of public finance tools and urban planning efforts in and around downtown and white neighborhoods on the North Side, aggravating economic disparities between the city’s neighborhoods. The city’s favorite economic development tool, Tax Increment Financing (TIF), has a history of supporting already affluent white areas with public subsidies for private developers. TIFs, funded by a portion of property tax revenues in designated districts, are supposed to be used in so-called “blighted” areas that would not see private development without TIF assistance, which usually comes in the form of public subsidies. Because the TIF program is dependent on property tax dollars, it leaves low-income black communities at a structural disadvantage. And even when these communities have TIF dollars to use, the city has a record of transferring these funds out of these districts or leaving them in the districts unused. Loyola University Chicago political science professor Twyla Blackmond Larnell said the city’s TIF program is a spiritual successor of government-funded “urban renewal” efforts that took off after World War II and spanned into the 1970s. While there are differences between the two programs, Larnell says they have worked to the same effect: widening economic inequality between neighborhoods while picking winners and losers in the community development game. Critics of urban renewal “claimed that the city’s pattern for redevelopment consolidated wealth,” according to the records of the Chicago Department of Urban Renewal. Similar complaints have been made recently about the city’s TIF program. Like TIF, urban renewal efforts used government dollars to revitalize parts of the city that officials deemed blighted by displacing people and businesses, using eminent domain to seize buildings, and then selling those buildings to private developers with a public subsidy or discount. These public-private redevelopment projects helped transform various areas that today are affluent, like the central business district in the Loop and other areas near downtown. However, the (mostly black) people swept from these areas typically reaped meager benefits: many were relegated to dense high-rise public housing projects and restricted by segregation. “Tax increment financing is kind of just this new form of [urban renewal], in which we’ve seen policies being passed under the guise of improving communities but then essentially being co-opted by wealthier individuals and used for their own interest,” said Larnell, whose research focuses on urban politics and public policy. She argues for a more community-based, inclusive, and transparent approach to economic development in Chicago that reverses the pattern of disinvestment in the communities that need the most help. Harte said part of the timing behind the launch of the collaborative was motivated by the emergence of new potential community development financial tools in Chicago that she said will complement her organization’s plans—tools that may fulfill Larnell’s vision of a more equitable development strategy. These tools include the Neighborhood Opportunity Fund, a mayoral initiative that expanded the downtown zoning designation. This allows developers to skirt constraints on the density and height of new developments for a fee, and funnels their dollars toward neighborhoods struggling to attract market investment. Another tool is the Chicago Community Catalyst Fund, also known as Fund 77, a program that city treasurer Kurt Summers pitched to a receptive Rahm Emanuel; it would invest $100 million in city funds over three years and use the returns to help finance local entrepreneurs and lure investors to Chicago neighborhoods lacking resources. If Fund 77 and the Neighborhood Opportunity Fund are used as advertised, it would represent a major change in how the city invests in economic development in underserved communities. Costa Capital Partners, LLC is making a huge commitment to invest in our communities. A up and coming real estate development firm based out of Chicago, IL. Ive worked with Patrick Capital Group on many south and westside projects. Orlando Patrick has done a awesome job in the way he and his team handle true community development. He has recently started a new firm Costa Capital Partners, LLC with partners Dr. John Flick and Dr. Faisal Lala. I cant wait to see their impact with our neigborhoods of Chicago and other states in which they do business. Our group of guys!!!! !